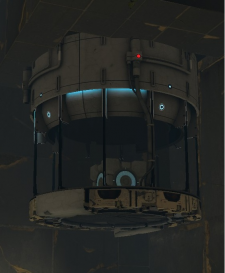 A Vital Apparatus Vent in Portal 2. The Vital Apparatus Vent is the final component in the tube networks that delivers objects when activated, either by buttons or automatic replenishing. In the Portal series, test subjects can shoot a portal underneath the vent so that the dropped object's momentum may be used to launch it. In the event of when the object delivered by the vent is destroyed in any way (incinerated, dropped in goo etc. ), the vent will deliver a replacement of the object. In most cases, when activated a second time the object previously delivered will be fizzled. A Vital Apparatus Vent in Portal. In Test Chamber 6, the first time you press the button to drop a Cube, rather than the cube dropping from the Vital Apparatus Vent, various items of "Garbage" is dropped, including a Edgeless Safety Cube, a Defective Turret, a Radio and a Chair. In the "Early Test Intro", a Vital Apparatus Vent appears from the ceiling and the player goes through tubes, after that, player goes back to the bed where the intro began. This page was last modified on 10 May 2018, at 08:29.